Chinese has always been one of my top choices for nights when you just want to order a take away. However, eating deliciously greasy take-aways on a regular basis isn’t always the healthiest or most budget friendly option. Making your own homemade version is not only usually cheaper, but it allows you to control what you’re putting in to it and customise it exactly to your tastes. This Tofu & Vegetable Stir Fry in Soy-Maple Sauce has all of the flavours I love from a Chinese take-away, but with a little less guilt! If baking the tofu, preheat oven to approx 215 degrees celsius. Remove tofu from packaging and drain. Press in a tofu press or in between plates to remove extra liquid. Leave for a few minutes. Chop all of the vegetables for the stirfry and set aside. Cut the pressed tofu into bite-sized cubes. 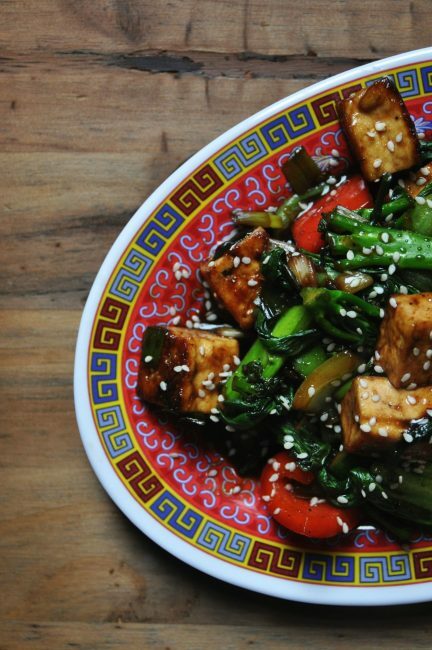 In a bowl, gently toss the tofu cubes in corn flour and a small drizzle of soy sauce. Let sit for a few minutes. Combine all of the ingredients for the sauce in one bowl and make the cornflour slurry in a separate small bowl by combining the cornflour and water very well so that there are no clumps. If baking the tofu, place the tofu on a lined baking tray or silicone mat in the oven and cook for around 15 minutes or until golden and crispy but still a little soft to the touch. If frying the tofu, heat two tablespoons of vegetable oil in a large fryin pan on medium heat. When the oil is hot enough that it sizzles, carefully place the tofu pieces in the pan. Make sure the pieces do not touch as they will stick together. Let them cook in the oil without touching them (but still keeping an eye on them) until they start to become golden and crispy. Flip them over to crisp on all sides. Once this is done, take the tofu pices and place them on some kitchen roll/paper towell to absorb some of the excess oil. Leave to the side for now. 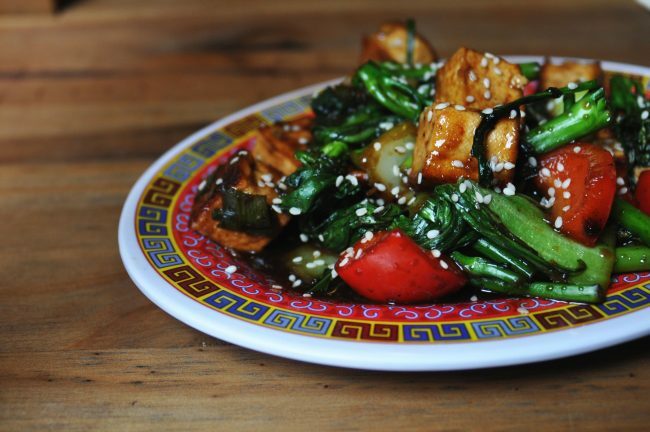 In the same pan with the oil, flash fry the vegetables on high heat with the two tsp of soy sauce for some extra flavour. Constantly stir the vegetables so that they do not burn. Do not overcook the vegetables. When done, put the cooked vegetables on a plate and set aside. In the same pan reduce the heat to medium and add the sliced spring/green onion (reserve some for garnishing if desired). Adding minced garlic and ginger at this stage is option but will enhance the flavour. If adding, cook with the onion. Once the onion starts to become a little translucent but not fully soft, pour in the soy-maple sauce mixture. Slowly add the cornflour slurry, stirring constantly until the sauce starts to thicken. Once the sauce becomes thick, add in the cooked tofu pieces and coat them fully. Then add back in the cooked vegetables and make sure everything is well incorporated. 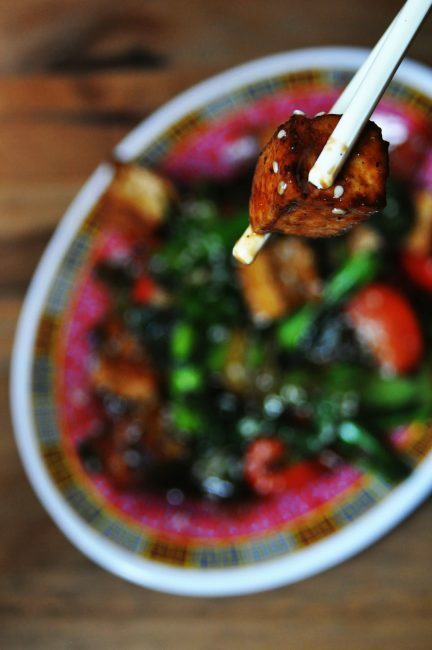 Serve the stirfy in plates with jasmine rice and garnish with with sliced green/spring onion and sesame seeds if desired.